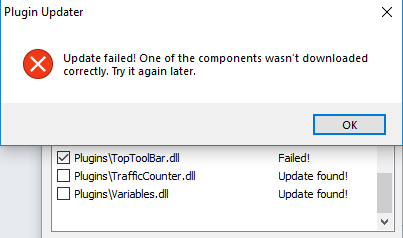 I switched the update channel to stable with debug build but now the update checks fail. Should be fixed now. Stable versions located inside /stable subdir. I get this error on different computers. Works for me. Sometimes there is such a problem with an unstable Internet connection. Can you test this from clean Miranda? I already tried the clean Miranda. Didn't work. With Process Monitor from Microsoft I saw that Miranda was downloading the hashes file and there were more hash files in the temp folder. Somehow it seems Miranda tried to extract and use the wrong hashes. I deleted the temp folder and everything is working again. Next time it happens, please provide a network log. It provides useful infos. In before "check your antivirus quarantine". No antivirus installed. When there is a new update to Miranda, I will try to replicate the issue.